There will be a “Park-N-Play” Ocoee clinic on August 12th hosted by gca instructors Jesse Hebden and safety boaters Jay Davis and Mark Brown. Meet at the middle put in at Noon (12pm). Email boat.safely07@gmail.com to register for the clinic or any questions. 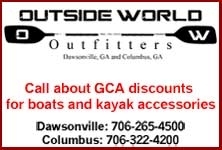 This clinic is for experienced Ocoee boaters and not 1st timers, with at least an 80% roll. We will screen applicants. This clinic is for people who have run the Ocoee multiple times, but still get nervous around its numerous class III rapids. This will help with your jitters and teach you to relax in turbulent water. We will work the eddies, surf the hole, and dodge rafts! Positive attitude is a must! !